Why should I bother to do a cleanse for bone health? Here the answer in a nutshell: 1) Toxins make the body more acidic; 2) Too much acidity in the blood causes the body to leach calcium and other minerals from the bones to neutralize blood acidity; 3) Bones then become weak and porous. Better to get rid of unwanted acidic toxins in order to maximize the alkaline 4.38 blood pH level that the body prefers. 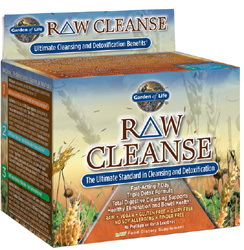 So…I just bought a box of RAW CLEANSE from Garden of Life and have put it on my schedule to start this one-week cleanse on Ash Wednesday (Feb. 22, 2012). But first, I’ve got to get ready! Drink at least the recommended 64 ounces of filtered water each day. Not hard; I usually do this anyway. Eat fresh fruit, vegetables particularly crucifers and bitter greens (such as broccoli, cabbage, cauliflower, endive and radicchio), seeds, nuts and lean protein- organic whenever possible, with wild caught fish. Again, not hard. Fresh fruits and vegetables are features of the 80% alkaline, 20% acid OsteoDiet. Increase your healthy fat intake by adding 1 teaspoon to 1 tablespoon each of organic coconut oil, flaxseed oil, cod liver oil and olive oil per day to your diet. I can add 2 tbsp. of flaxseed to my cereal or shake, and I can use organic coconut oil and olive oil as my cooking oils. I also take a capsule of fish oil daily. Keep high allergen foods, such as dairy and wheat products to a bare minimum. I eat pretty much gluten-free already. When I do eat foods containing gluten, however, I take a digestive aid that will break it down. Same thing with dairy: When I consume dairy products, I take a digestive aid to break down the casein. Normally I use Similase GFCF, but I’ve been trying a new digestive aid this week: Digest Gold. I’m not sure which is better yet. Eliminate caffeine, tea, coffee and alcoholic beverages. Hmmm…this one’s a little harder. I have one cup of caffeinated coffee in the morning (1/2 decaf and 1/2 caffeinated) + 2 tbsp of International Delight creamer, which contains sugar. Okay, out it goes for the week of the cleanse…maybe longer. Instead of coffee, I’ll have herbal teas or green tea–decaffeinated, of course. Eliminate added sugar, refined flour, processed foods and fatty food with trans fats. You’d think this one would be easy, but I just l-o-v-e high-protein, FAGE brand Greek yogurt! Although FAGE brand yogurt contains sugar, I still buy at least two containers per week–usually more–of the 0% flavors, like Blueberry Acai Berry and Cherry Pomegranate. For the cleanse week, instead of flavors containing sugar, I’ll buy plain FAGE Greek yogurt and flavor it myself with a small amount of agave nectar, a few drops of vanilla extract, and some fresh fruit. The rest of these–the refined flour, processed foods, and trans fats–disappeared from my diet long ago. Eliminate skin care products with ingredients you can’t pronounce. The only skin care products I use now are Coconut Hand and Body Lotion by Desert Essence Organics -and- Pevonia Rejuvenating Dry Skin Cream, which contains natural ingredients. Use natural cleaning products. Now here’s an area for definite improvement! I haven’t paid any attention to this idea, even though I’ve occasionally seen it in articles I have read. Looks like I’ll be buying some Greenworks products, as well as trying my hand at making some non-toxic cleaning products at home! I’ve got a couple of weeks to get ready. Wish me luck and say a prayer for me! I’ll do the same for you.